Oh, I`m so hurt! Oh, your so mature! Oh, your so funny! To be fair i don't think any of us really believe that you guys will be any less/more disappointed than anybody else. 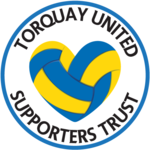 After all, at the end of the day we really are all Massive Torquay United Fans on here, regardless of where we live, how many games we have been to, etc etc. I think the issue is, and always has been for me, is the constant criticism and comments surrounding Paul Buckle. The sharpening of the pencil comment, to me, alludes to the fact that should we lose, rather than come on here and throw your weight behind the manager and club, you are going to rip into it. And should we win i suspect you won't be on here giving Bucks the credit, i believe he deserves. You do come on here calling us Village Idiots, lemmings etc is it any wonder that people respond to you in the way they do? To be honest tufc01 i really won't be on buckles back if the unthinkable happens on sunday. Any response then won't change anything and i will be too gutted. I'm not bothered by the name calling and regard it as nothing more than a conversation we could be having in the pub where intonation, facial expression and delivery tends to water this sort of thing down. I've held my ground since xmas of last season regarding Buckle and it would be hypocritical of me to pretend that i rate him now. So, i've rather painted myself into a corner but am happy with my stance. This game is so important for all of us as Gulls fans so for someone to suggest i/we would be happy if we lost is beyond stupid. To be a gulls fan doesn't mean you have to be a buckle fan. The gulls are far more important than PB. I will still be a gulls fan long after he has departed to dawlish or bideford. You're right, a chat in the pub would be better than on a forum but I can't be arsed to drive 180 miles. Jeez I'm tense waiting for Sunday! His track record in big games is poor. He is due to win one soon tho, even a blind squirrel in the dark will trip over a nut eventually. Night vision goggles have been on for this squirrel of recent what with 4 points off our play-off rivals over the season, defeat of Burton twice and despatching Histon in the play-offs. If anything, over the season, it is the less fancied sides we have struggled against. Though, of course, your theory was really only ever based on the 2 legs with now League 1 Exeter, last year. I'm still clinging on to that Toddy winner dream. Interesting to hear Buckle say how Stevens and Benyon have been good from the bench this season in the Press Conference. A bit of kidology there? The Fergie parallels continue! Rob, yeah sorry i forgot. Beating part time teams who finished above us, my mistake. Mark, i agree. The ability to change ones mind and learn is a disirable trait. I've not been convinced PB has learnt that. My job requires that ability or you get fired. Dave, can you honestly not see the contradiction in what you've just said? "I've held my ground since xmas of last season regarding Buckle and it would be hypocritical of me to pretend that i rate him now. So, i've rather painted myself into a corner but am happy with my stance"
So whatever Buckle has done since then, and may do in the future, you will not change your mind? "The ability to change ones mind and learn is a disirable trait. I've not been convinced PB has learnt that. My job requires that ability or you get fired." currently on setanta 1 , preview of sundays match plus other things. Yes, the Champions and the side that knocked Leeds and Swindon out of the FA Cup. You missed the bit about 4 points over play-off rivals - that includes Cambridge - though I'm glad you accept your error without denying the accusation. Most appropriate. Well done. Merse, how the club and team are approaching the game, was one thing Chris Hargreaves talked about on the Legends night. He said they were travailing up the day before for this game, last year thew went up three or four days before. Keeping things more focused and treating it like just another game that is needed to win, is best achieved by keeping things much the same as for any other game played this season. It was very clear from what Chris said that they all will give everything they got to get the required result, but he said in the end what will be will be and that has to be how we view the whole game and the final result. I do despair when some fail to see that Bucks has learned so much from last season and the real progress he has made as a manager. While I still feel there is always room for further improvement in all his skills, no one surely can complain about a first season in a play-off semi final, a Wembley cup final and now one better this year with a Wembley play-off final. I have said for some time now, that I don't believe we as fans deserve to end up in tears for a third season on the trot, its the real reason I feel its not going to happen this year and any tears will only be tears of joy. I simply don't want to think about defeat at this time, but like you I would still feel if that happened we had gone one better than last year and could go one better again next season. I still have some fears about the fact that I believe it would be a much harder task next year to get out of the BSP and have given all my reasons on the forum before. One fear I do have at this time is fans expectations getting far to high again, its great to believe and be positive but you also need to be prepared for any defeat. I remember the early games in our season, me trying to get this forum up and running well and how much better and easier it would have been if we really had started the season well. We did not and the forum at that time often seemed full of negative posts. I would love nothing more than this forum on Sunday night buzzing with real happy and celebration posts, but an aware a defeat would see a mixed bag of posts. Some just excepting that we gave our best etc and others looking to lay blame on Bucks or even certain players. The fact is we are all in this together, the fans the club and the team and we need to celebrate together if we win, but also remain strong and together if we did not. There are two teams and two sets of fans who want to win this game more than any other this season, it has to rank as one of the most important games both teams will have ever played in and only due to the prize on offer. I'm sure we have all the right players to win the game and see our team return back into the football league and I also firmly believe no matter what the result we will give a good account of ourselves and will leave the field with all our players holding their heads up high and you can't ask for any more than that. Dan, fair point. He's done nothing to change my mind since last season. In the future, starting sunday i hope he proves me wrong. As for the P45. I'm mulling over a job offer in Bali which is why i won't be at the game. Rob, i can list a stack of teams we failed to beat at home which cost us auto promotion. However i hope this will be a moot point after sunday when we can argue the toss from div 2. Aussie, i really hope we meet some day. We can discuss these little spats over a beer. Anyone who knows me will tell that i'm an ok chap with strong opinions. But i don't put up with fools. I know the cyber pub can be misleading and i will cut you some slack. When we meet, hopefully soon, we can laugh about our misunderstandings and part as best mates.